Ina Garten's new cookbook How Easy is That? is being released Oct. 26 and I'm kinda excited. I love her recipes to bits. 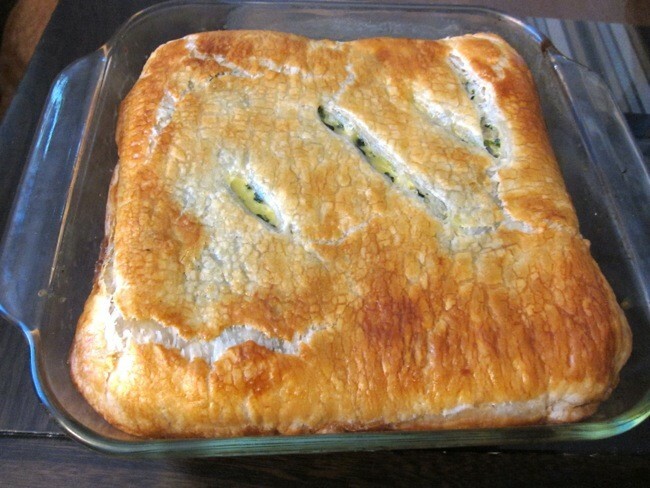 Here I've adapted one of her recipes, Spinach in Puff Pastry, into a thick spinach and smoked salmon pie. The original dish is chock full of spinach in a cheesy mixture, wrapped up in a flat puff pastry envelope. I gained inspiration to create this pie, a spin on her recipe, after a visit to Trader Joe's a few days ago. They were sampling some spinach, feta and salmon puff pastry appetizers in the back (where the free mini cups of coffee are) which were simple and surprisingly tasty. Using that same spinach/feta/salmon combo, I turned Ina's Spinach in Puff Pastry into a deep dish pie and incorporated feta cheese (instead of Parmesan) and added a layer of smoked salmon. I think I've found a dinner winner. As the pie bakes, the puff pastry will turn a golden brown and the butter will bubble, filling your house with the delicious aroma of butter. It is to die for. 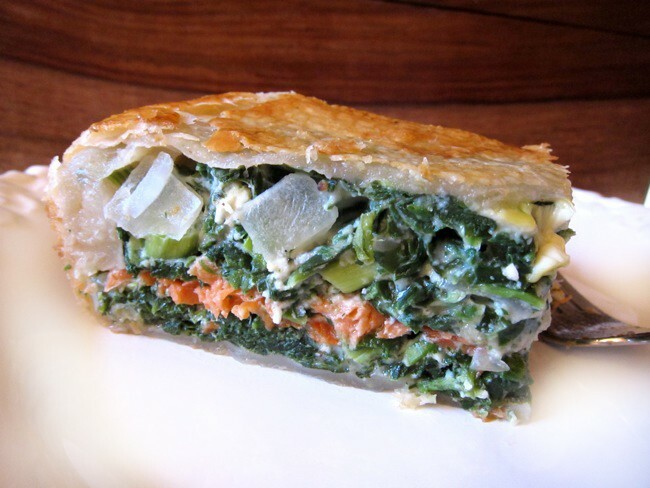 Anyway, try this Deep Dish Spinach and Smoked Salmon Pie because it really is delicious. And it's pretty too. Each slice of pie has a crispy bite since the spinach filling is entirely encased in flaky pastry ... heck, we can probably call it Spinach en Croute. The smoked salmon adds a depth of flavor without being overwhelmingly fishy, and the feta adds plenty of salt, which makes the dish highly flavorful. When you cut it into neat slices, you can see gorgeous, colorful layers. Preheat the oven to 375 degrees. Heat the olive in a saute pan and cook the onions over medium-low heat for 5 to 7 minutes, until tender. Add the garlic and cook for 1 more minute. Meanwhile, squeeze most of the water out of the spinach and place in a bowl. Add the onion mixture, scallions, Gruyere, feta, eggs, bread crumbs, salt, pepper. Mix well. Unfold one piece of puff pastry, roll out until it is large enough to cover bottom and sides of a 9 x 9" baking dish, poke with a fork and and place the square baking dish with the edges draped over the side. Scoop the 1/2 spinach mixture on top of the pastry in the baking dish. Layer on smoked salmon. Scoop the other 1/2 of spinach mixture on top and spread even. Roll out the second piece of puff pastry until it is large enough to cover dish with some edges to tuck in. Place the second sheet of pastry over the spinach and tuck the sides down into the baking dish (between the other sheet of pastry and the dish). Pat the top to push filling and pastry to edge of pan and to flatten it out. Brush the top with egg wash and then use a knife to cut a few slits on the top of the pastry (to let the steam vent). Bake for 30 to 40 minutes, until the pastry is lightly browned and puffy. Let cool 20 minutes before slicing. Serves 6.